Week 7 started with a bang. We departed Hami for Dunhuang. Our briefing prepared us for 90k of very rough roads as we needed to pass through a construction zone. What an understatement. The day started easy with 100k of brand new road. I started to wonder as we passed several km of trucks of all types stopped on the highway. We worked our way around, through on the shoulder as we approached a weigh station and gate that started the construction zone. Right away it got interesting as the first few hundred meters was loose sand as we worked our way down the outside shoulder with trucks lined bumper to bumper as far as the eye could see. The dust was unreal, often you would have to wait a few second for it to clear just to see. Dan was the trailblazer and decided that the right shoulder was not working too well as it was loose and there was not much escape room as were were inches from the trucks. So we moved to the center to lane split. The ground was better not withstanding potholes and loose gravel every few feet, but we had room to move. Trucks had little room themselves so we were a few inches on each side of the bars from the large trucks going each direction. 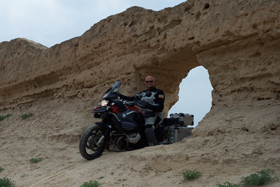 After the first few kilometres it would open up here and there with the odd bit of loose sand to grab the bars. It too a few hours to do the 90km and everyone was quite satisfied with themselves for enduring such a technical and risky adventure. With no other way around and not truck chasing we had to make it through to continue. Several times during the trip there may be obstacles that may challenge riders here and there leading to some apprehension. This time it was very impressive that all riders attacked the day and made it through within a few minutes of each other. Very impressive and a great teamwork. We made our way to Dunhuang after the construction zone to find Dan repairing a flat. He has had some bad luck with flats, but he was almost done and we were on our way. You cant let your guard down even for a minute as there was a huge oil spill in our lane of the road. Would have been big trouble had anyone hit it, but we all saw it and made it around. The first few days in China the food was awesome and a refreshing change. Fresh vegetables, fish and all served on round tables with a lazy susan. However we are in China almost three weeks and sometimes too much of a good thing can lead to the need for a break. Luckily KFC has opened up a few stores in China and a couple times we have been able to get a western food break. Our guides have been great arranging for eggs in the morning and typical western breakfast as noodles is a bit odd to start the day. Fuel has not been an issue in China. 93 and 97 are available at most gas stops. However the rules for fuelling motorcycles requires the rider to use a large oil can to fill the fuel at the pump and then carry the fuel to the bike parked well away from the pumps. This came from the risk of fuelling two stroke bikes and scooters that have a higher risk of fire. We often have to plead with the attendants (yes we have not pumped gas since Turkey) to fill the bikes directly saying Boa Ma OK. Fortunately it works most of the time after a little excitement and pleading. Sightseeing highlights for sightseeing during week 7 has been the visit to the Mogao Grottoes consisting of several hundred caves decorated with Buddhist grotto art and statues. 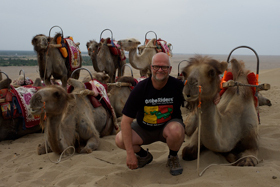 We also were able to visit the Mingsha sand dunes and enjoy a camel ride. A nice lady with five camels walks several km with the lead camel on a leash up a large sand dune and back down. Definitely will keep you in shape with that job. After Dunhuang we headed for Jiayuguan where we were able to see parts of the Great Wall and the Great Wall fortress dating back to the Ming Dynasty. We hiked up the wall to a tower on the hill and back down for a scenic bit of exercise. The highlight of Week 7 was a visit to a local school in Lanzhou. After a frustrating day of traveling and playing hurry up and wait, we worked our way into Lanzhou the largest city by far we have seen in China. It became clear why we waited to be escorted into town as it was BUSY with TONS of traffic. We were led down a street to the entrance of the school and were greeted by dozens of students with a large banner welcoming us. Immediately the frustrations of the days ride were lifted and each rider was surrounded by students asking questions, getting autographs and pictures with us on our bikes. 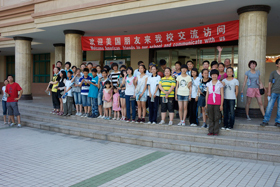 Most students study english and were eager to talk to us. They were taught very well as they were all articulate and thoughtful with their questions. Most wanted to know our opinion of their country and were keen to see our positive reaction to the people and our experience. We were led to their classroom and met some of the teachers who were just as eager to meet us. For sure this was a special event none of us will forget. Riding down the highway this morning I thought it would be smarter to wait until home before opening up the speedo on the bike on the theory that it might be better to get fixed on my side of the water than over here. Minding my own business and listening to some tunes at about 140 up comes Dan and John our two fastest riders in my rear view mirror doing 160+. I thought time to open this puppy up! Cranking open the throttle the bike was doing 180 in no time. They were on my heels so on I went to not far off 200 and actually opened up some distance cause I am a little lighter. The three of us screamed down the highway for about 20 minutes. Eventually the law of averages catch up (a blow out being the biggest one) and I backed off but it was a thrilling run while it lasted in perfect and safe conditions with no wind or traffic. Gotta be crazy sometimes! The Gobi is cool. Such myriad contrasts to marvel at. There are wind farms, hydro lines, big transmission towers, small hills, large, snowy mountain ranges on the nearby horizon, rocks, sand, green fertile areas, just a potpourri of man and nature all intersecting. I actually had a little tear in my eye realizing just where I was at that moment. You have to look at the attached picture. In the middle of bloomin' nowhere there is this 'gigantic' overhead highway construction project criss crossing our toll road going god knows where. And it is completely closed down! This is China I guess but I was frankly amazed at the scope of the over pass which is bigger than anything I have ever seen. I really hope that China makes it and they deserve to for their own selves and the rest of the world. There is a lot of mis-information out there, there are risks but they all seem to be nice, hard working, helpful and reasonably glad to see a westerner (not many of us around here). I am sure it is different in the dog eat dog central and coastal areas but it all seems pretty nomal to me here. 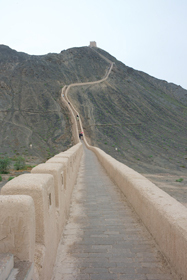 At precisely the time that our group was touring the western most portion of the great wall, the Canucks were going down to defeat at home in game 7 of the Stanley Cup finals. They had a great run and it was too bad that the Boston Bruins won 4-0. Bridesmaids once more! It was a rainy, wet day for the first time in weeks so we had ponchos and umbrellas at hand and good not to be on the bikes. Judging by the torrential downpour and serious flooding in the south of China, we are lucky. It is hard to keep up with all of the long history of the wall so this is a capsule only. It was started in the 2nd century BC at the eastern seaboard side of China by the Qin dynasty who succeeded in uniting 7 kingdoms into one for the first time when the population was estimated to be about 20 million. The first wall was about 5000 km and many more were built intersecting and criss crossing over the centuries so it is over lapping. The farmers and agricultural people wanted to tend their crops and flocks and were not prepared to move. The nomadic tribes to the north (Huns and others) came marauding down to take what wasn't theirs and the result was these various walls built with forced labour, prisoners and the like- they had garrisons and watch towers along the way and used to communicate arriving danger using smoke signals. The one to the west we saw today was built by the Ming dynasty between 1368 and 1644. They took over from the Mongols and I guess they thought they were coming back! We took a good hike about 400' in elevation change to take in the cloudy views- at least it was a coolish walk! It is 8000 km in length and not as large or dominating as some of the others. Jiayuguan is a developing industrial town in the Hexi corridor specializing in iron and steel production. It is quite prosperous according to our guides and is supposed to be a tourist destination for locals. The streets are Parisian wide which is surprising for a population of only 130,000. -again almost no dogs, never a cat to be seen; maybe they are in the pot! -with all the sunshine, wonder why they are not big into solar panels yet- must be coming. Oh, one last thing. There is a big time entrepreneurial opportunity for somebody to make a fortune in the carpet replacement business! They are way past their due date almost everywhere we stay and stick out like a sore thumb in hotels that should know better. Ugh! Tonight at a pre-arranged dinner we met Jeff Mahl whose great grandfather George Schuster won the first New York to Paris automobile race in 1908 driving a Thomas Flyer. There were 6 cars heading west to Seattle then by sea to Vladivostok and 3 finished the incredible 13000 mile overland journey in 170 days (88 days running)- what a feat for those times! Jeff and his team are re-enacting the jouney 103 years later and it was a pleasure to leaf through the story about his 'Great Gramps' adventure. Leaving Jiayuguan we stopped shortly for gas. I filled and left on my own and ran smack dab into this rather sizeable city called Jiruquan. It didn't take long for brainy one here to get the confusing almighty green line fouled up once again (tons of streets and it is only approx. anyway). Running in the wrong direction in a city like this with no understandable signage and no one to talk to can leave one with a dry mouth in a hurry. By the time I headed one way for numerous miles and turned back to my original 'T turn' decision point I was running right into a busy downtown all by my lonesome. Eventually I figured things out and got back on the green line but it wasn't before I was at least a half hour behind the last chase car (we have two in this country for obvious reasons). If it is any consolation to the reader, the great Helge P. himself screwed up his directions at least 3 times today while leading his faithful brood so I don't feel too bad! 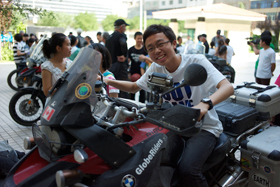 Today's 520 km ride was the best to date in China. If today was the only day to be a motorcycle tourist in this country then we picked the right one. We travelled on pleasant secondary highways through the countryside and passed by many small and not so small towns and villages. Often there were young poplar trees planted by the roadside for a wind or a sun break which was a nice touch. It was marvelous to see the industry of the people, everyone with a purpose and something to do- if they pass us by someday it will be our own damn fault. Not an overweight, deadbeat, long haired drop out to be seen anywhere. The corn fields were neat and tidy, the little vegetable patches outside peoples homes were well kept. Sure there was the odd slummy stuff here and there but I really sensed some pride and effort in the people in this area. -the further east we travel the more toll highway signage is in english quite often with amusing mis-interpretations. The highlight of the day was riding our bikes through the Great Wall, quite a thrill! We took the opportunity to do a photo op and then moved on. We arrived in Wuwei quite late in the afternoon and immediately recognized a different pace of traffic, much more dog eat dog. I had one close call near to our hotel where a scooter did a blind U-turn and headed right at me. All okay though. We checked in to the Tian Ma Hotel in the central district, had a shower where more water ended up on the floor than down the drain, had another foregetable lazy susan dinner and headed out for a walkabout. What a bee hive of activity on a friday night! Lots of people, lots of stores and commercialism, lots of honking. That all lasted for a short while then an ice cream and to bed. Even though the 290 km ride was a lot shorter than yesterday it was much more tiring, quite long and fairly hard work due to the broken up nature of the roads, the traffic and the many communities we travelled through- lots of passing to make time and standing on the pegs, etc. It was still enjoyable in terms of the riding effort and watching the world go by, it was just different. We stopped for lunch and all had our bikes washed while they cooked our fare. I was lucky enough to be first so spied a mattress in a small room adjacent, paid a 10 yuan tip to our washers and laid myself down for an hours nap. They worked hard to make our bikes sparkle and I felt so elated after the nap that I gave them a 100 yuan tip ($15) which was not far off what they got in total at 10 yuan per bike. 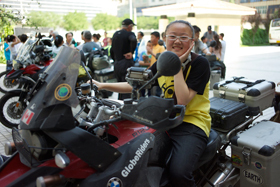 It was a blessing driving in to Lanzhou a population of 2.8 million on a saturday as the traffic was more manageable. Our destination before the hotel was a local school and I was hot like hell (about 35) and keen to find someone to jam out with me. All wanted to go to the school and I was glad they did. The day school houses 1500 kids from grade 7-9 and about 100 were there with their teachers to welcome us. We had purchased a bunch of soccer and basketballs as a gift. It is an affluent school and we had a very rewarding cultural exchange with these 13-15 year old kids. They spoke some english but it was most fun exchanging views and discussion with their english teachers. They were wowed by our bikes (like everywhere we go). Our hotel is very nice and we have good pressurized water for showers and the food is better. Chris and I split up for the 2 nights here at about $80 per night for the extra room. We have done this a fair bit where doable which has worked well. Lanzhou is an petrochemical industrial city, the capital of Gansu province and looks to be a prosperous city. There was no pollution whatsoever coming in although I understand that the heavy sulphur content in the coal fired energy plants can create havoc in this hill rimmed city when there is no wind to blow it away. One interesting feature about Lanzhou is that it is strung along the Yellow River which is 5400 km long. It is one of the 3 great rivers that drain the Himalayas along with the Yangtze (6300 km and 3rd longest in the world) and the Mekong. Today was a touring day but I felt tired and lousy due to some diarrhea. I have been lucky so far compared to others and have only had occasional bouts (sticking to mostly vegetarian as mentioned). I was afraid about having to use a squat toilet but managed to struggle through by passing on lunch and getting a taxi to the hotel. Our first stop was to take a raft trip down the river on some inflated sheepskin carcasses. It is a 2000 year old method of travel whereby they tie these things together in bunches. We had 4 aboard and a speedboat (?) brought us back but I believe they used to build them for groups of up to one hundred at a time in the old days. Next we visited their excellent silk road museum for a tour and some more education after which I broke away and headed to the hotel for some rest. Two more riding days of 329 and 293 km before Xian! Fairly easy 330 km through picturesque Chinese countryside with secondary road elevations of 6 to 7000 feet so it was cool for a change- noticed quite a few hanging willows planted beside the roadsides as a nice touch . The stepped hillsides are all well cultivated for the growing of corn (also wheat and oats). Eagle says most of it gets ground into corn meal for feeding the animals now although it was a regular part of his parent's diet years ago. I have been feeling rough in the tummy the last few days so did not stop for lunch. 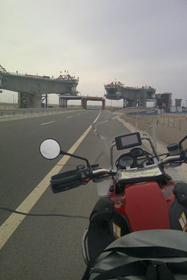 With 120 km to get to Pingliang off I went on my own. It got a little bleak with cold drizzle, fog, longish tunnels and a bunch of over turned trucks along the way likely due to fatigue on the road. It is not something I would have contemplated at the beginning of the trip but no big deal now. Got to the town and the gps waypoint was way off so hired a taxi and back tracked 12 km to our 5 star hotel where I showered and then treated myself to a great massage. Speaking of showers the Chinese are famous for leakers. No matter the quality of the hotel, more water usually ends up on the floor than down the drain. Strange as hell but that's the way it is. Would you believe that Facebook, U Tube and Twitter are blocked country wide ?? Note. In Turkmenistan, The Globe Riders web site is also blocked.. Go figure that one out !! For motorcycles travel is blocked on the "state" roads. These are the limited access roads that are being built accross the country and are beautiful high speed roads. One day we did make entry because Helge with his lack of Chinese language skills just showed a map of our route and the big boss at the toll gate let our group of 12 pass.. At other toll booths in the country motorcycles just stay right at the toll area and don't have to pay the toll !! If only that was possible at home !! Also at gas stations the official policy is not to fill up motorcycles at the pump because of the "exposed" hot engines being a possible problem in case of a fuel spill ?? Some stations let us fill up with the pump directly but other stations have a motorcycle/motorbike sign at the edge of the station area. They would then bring over a large 15 liter can to pour in and in some cases there would be some spillage because of the nozzle from the open can !! Food. For most lunches and dinners we are served food on a large round glass "turntable" at the table. This is spun around for the food of your choice. They food is starting to look all the same. Vegetables, soups, salads, noodles, breads and much more. Have even been served warm Orange juice and cold tea in the morning. Best coffee has also been Nescafe. In the last 2 cities a few of the boys have reverted to Kentucky Fried Chicken out as the alternative !! Looking forward to American Hamburgers, Steaks, French Fries and good old bacon and eggs soon !! Our group of Americans, 3 Canadians, one Frenchman and one Kiwi are doing well. Many different personalities and styles have gotten along considerable well considering the 52 days and almost 8000 miles together. Currently in Lanzhou, China along the Yellow River. Today had a short ride on a raft downriver. The flotation under the raft was blown up sheep bodies without heads and feet !! A method used back in 50 AD or so for transport of goods down river ! Yesterday we visited a private elementary school for ages 10 to 13. Approximately 75 English class students and their teachers met our group for an hour or so. All were extremely well spoken ( in English of course ) and polite. All wanted to try their best English which was very good. Much better than our Chinese. With many autographs and photo requests of our group we felt like real rock stars. Soon on to Xian and the Terra Cotta warriors. The end of a wonderful trip is soon coming to an end. As I said to Helge today, when I get home I now have a lot more history and religions of the Silk Road from Istanbul to Xian to study. Way too much to understand and comprehend on this quick trip.